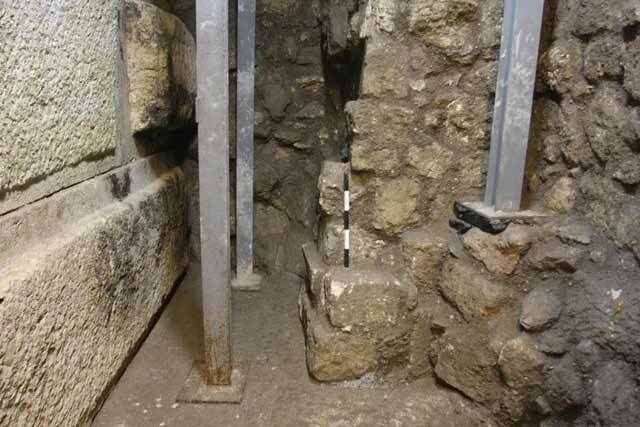 In 2015, documentation and conservation work of the foundations of the Western Wall in the Davidson Center Jerusalem Archaeological Park was conducted in conjunction with an excavation (Permit No. A-7320; map ref. 222305–20/631442–70), for the purpose of preparing the site for visitors. The excavation, undertaken on behalf of the Israel Antiquities Authority and financed by the El‘ad Association, was directed by M. Hagbi and J. Uziel (field photography), with the assistance of N. Nehama (administration), H. Etun (surveying and drafting), A. Peretz (photography), A. Ajami and G. Berkowitz (foreman), O. Cohen and Y. Rosenthal (engineering supervision) and D.T. Ariel (numismatics). The soil removed from the excavation was sifted at the ‘Emeq Zurim (‘Tzurim Valley’) site under the supervision of I. Novoselesky.The conservation work was implemented by Y. Ivanovski, A. van Zaiden and S. Zach. 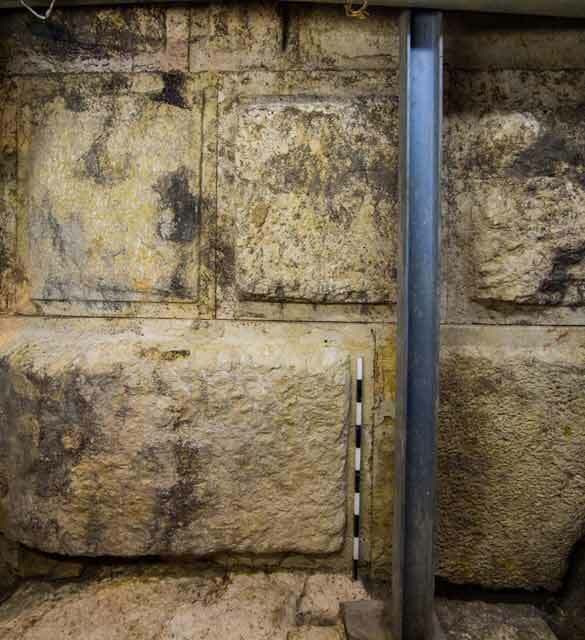 In 2012–2015, archaeological excavations were conducted along the foundations of the Western Wall and the system of retaining walls that was built adjacent to the Western Wall (Reich and Shukron 2011; 2012a; 2012b; Hagbi and Uziel 2015). These excavations unearthed the wall’s foundations along approximately 80 m, from the southwestern corner of the Temple Mount to the Mughrabi Gate in the north. Three courses of the Western wall (W101) were exposed, depending upon the height of the bedrock. 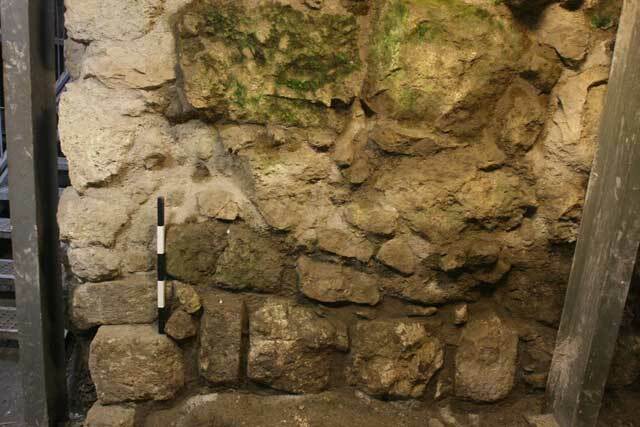 Also found was a series of retaining walls, all erected on the bedrock: a long wall (W102) running parallel to the Western Wall and lateral walls constructed at intervals of c. 2 m between the longitudinal wall and the Western Wall. Only the eastern face of W102 was revealed. Most of the finds at the site date to the first century CE. Three construction phases were discerned in these excavations: first the bedrock was levelled; then, the Western Wall was erected on the bedrock; and, finally, the retaining walls were constructed. 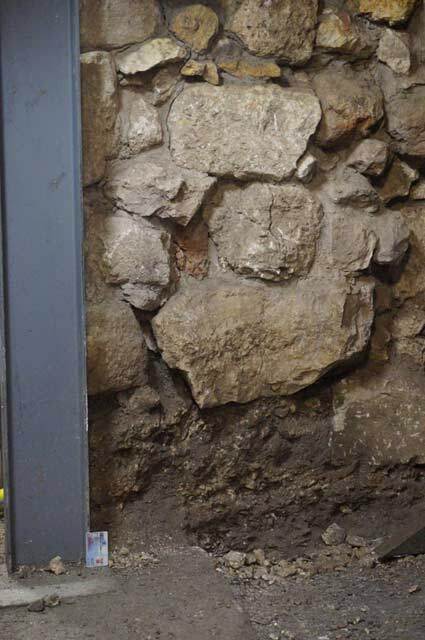 Once the stones of the Western Wall and of the retaining walls were exposed, conservation measures were carried out in conjunction with the ongoing excavation (Fig. 1). The Western Wall. The stones of the foundation courses of the Western Wall (W101; Fig. 2) were only partially dressed; they were cracked, their corners were broken, the surface of the boss was flaking, and part were broken and had fallen off. Some of the damage was caused during the wall’s construction, and additional damage occurred after the stones were exposed. 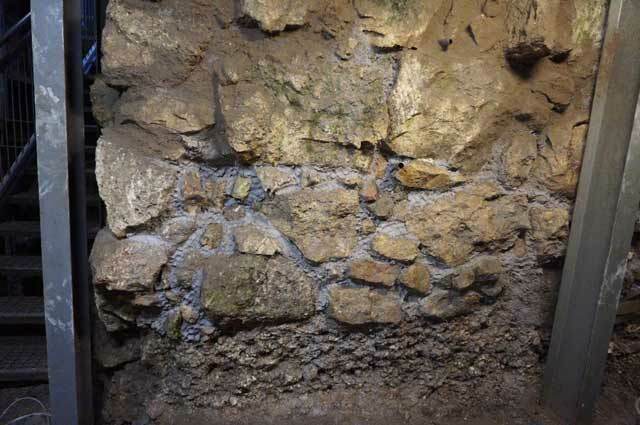 The exposed section of wall was carefully documented prior to the conservation work. This included (1) drafting; (2) describing the marks left by the tools used to dress the stones; (3) documenting the stones’ state of preservation and damage; (4) recording cement and plaster repairs carried out at the time of construction, including lines incised on the repaired sections so as to simulate the joint between the stones (Fig. 3); and (5) an overview of the treatments and repairs performed on the Western Wall today. This record was made in order to facilitate future research of ancient repairs and avoid confusion with the modern repairs. The conservation work implemented on the surface of Western Wall stones included filling fissures with mortar and reinforcing the face of the wall (Van Zuiden, In press). The System of Retaining Walls. During the excavations, some of the lateral walls were breached, leaving only short sections (length c. 0.5 m) that will preserve the plan of the retaining walls. 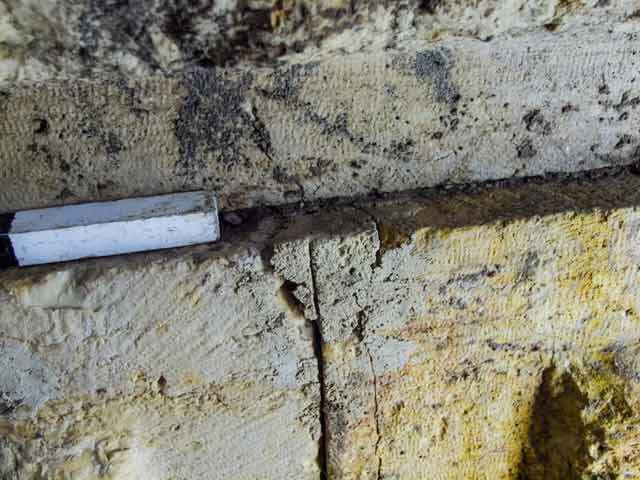 The conservation work strengthened the face of the remaining wall sections, and mortar was injected into the core of the longitudinal wall (Fig. 4). 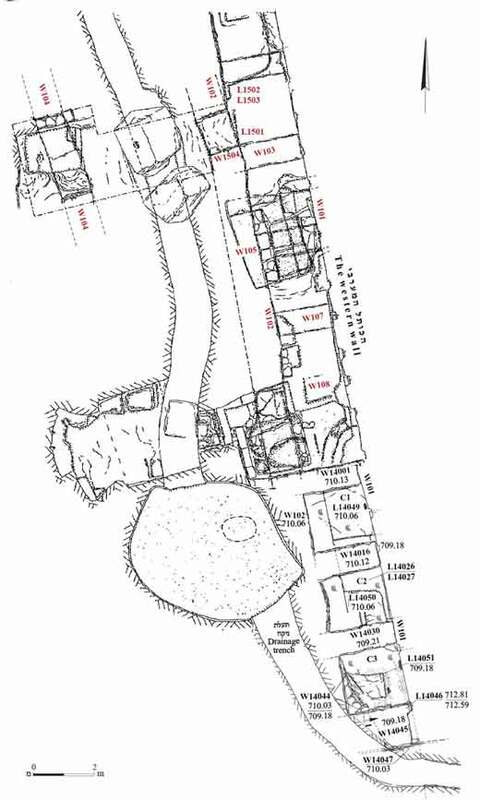 In addition, the longitudinal wall (W102) was built in two sections set on soil fills (the northern section of the wall was designated W1504 for the purpose of the excavation). The earth in these sections was excavated and replaced with ashlars in order to stabilize the wall (Figs. 5–8). While sifting this soil a coin was found that dates to the time of Archelaus (4 BCE – 6 CE). The system of retaining walls to the west of the Western Wall was built in order to raise the level of the city during the Early Roman period and support the stepped street. The construction of this set of walls was dated to the first century CE based on the coin discovered in the soil fill beneath W102. This date is consistent with the dates of both the fills previously excavated in the cells between the retaining walls (Hagbi and Uziel 2015; Hagbi and Uziel, In press) and the construction of the stepped street (Reich and Billig 1999; Szanton and Uziel 2015). Hagbi M. and Uziel J. 2015. 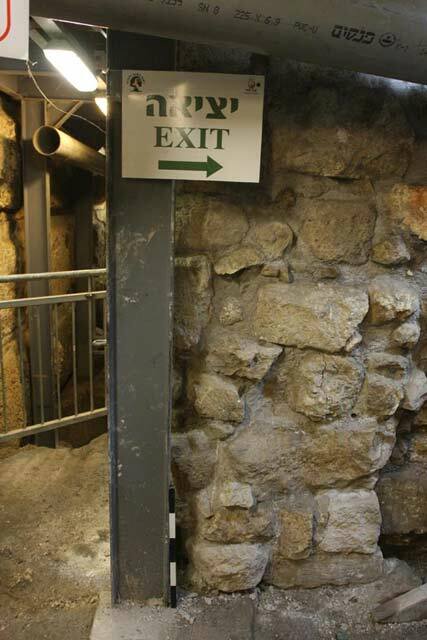 Jerusalem, The Old City, The Western Wall Foundations. HA-ESI 127. Hagbi M. and Uziel J. In press. Excavations along the Western Foundation, ‘Atiqot. Reich R. and Billig Y. 1999. Excavations near the Temple Mount and Robinson’s Arch, 1994–1996. Qadmoniot 117:33–40 (Hebrew). Reich R. and Shukron E. 2011. Jerusalem, Robinson’s Arch. HA-ESI 123. Reich R. and Shukron E. 2012a. Excavations in Jerusalem beneath the Paved Street and in the Sewage Channel next to Robinson's Arch. Qadmoniot 142:66–73 (Hebrew). Reich R. and Shukron E. 2012b. Excavations Next to Robinson’s Arch 2011 – from the Level of the Paved Street to Bedrock. In E. Baruch, A. Levy-Reifer and A. Faust eds. New Studies on Jerusalem 17. Ramat Gan. Pp. 219–238 (Hebrew). Szanton N. and Uziel J. 2015. On the Question of the Stepped Stone Monument from the Second Temple Period in the City of David. City of David Studies of Ancient Jerusalem 10:19–39 (Hebrew). Van Zuiden A. In press. Conservation Philosophy and Conservation work on the base of Western Wall. ‘Atiqot. 2. The lower courses of the Western Wall, looking east. 3. Cement repairs between the stones of the Western Wall, looking east. 4. Walls 14044 and 14045 after ashlars were incorporated as part of the conservation measures, looking south. 5. The section of W1504 prior to the conservation work, looking west. 6. The section of W1504 prior to the conservation work, looking south. 7. The section of W1504 after replacing the soil with stones, looking west. 8. The section of W1504 after replacing the soil with stones, looking south.